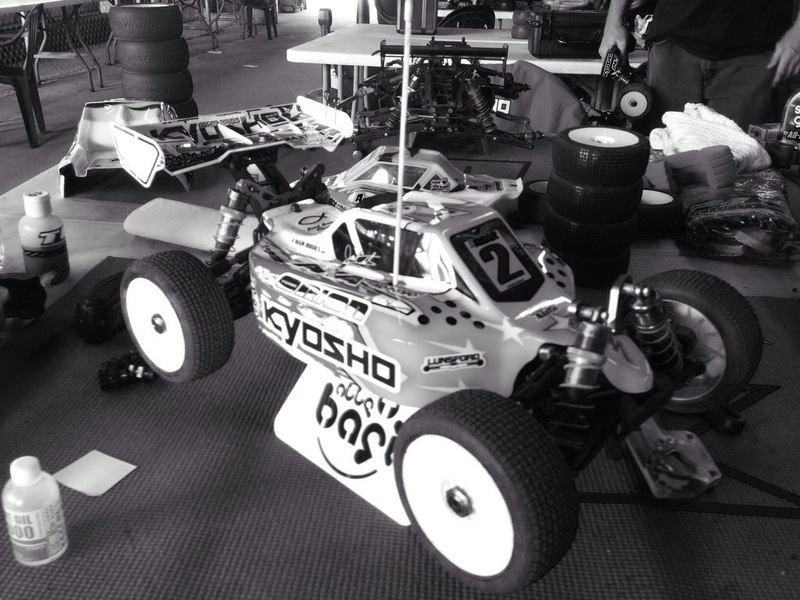 Today we had seeding practice here in Texas at the 2014 ROAR Electric 1/8 Nationals. With the wildly low entry turnout, it was a very relaxed day. Started off at 9am with a 2 minute practice through the heats to shake down the track and sort transponders. Then we 2 rounds of 8 minute timed practice. Both rounds taking your fastest 3 consecutive laps. Finished off the day with some open, controlled only by class, practice. Today was an ok day at the track, but I didn’t have speed and pace I wanted and expected to have. I felt comfortable yesterday and had a lot of fun driving. They changed that back jump, and it totally killed the track. The back section has no flow no, it’s pretty disappointing. I just don’t see how RC racing can grow. The sanctioning bodies are not funded enough to have the proper people, and do a proper job. This is supposed to be a National Championship event. The turnout is smaller than a weekly Wednesday night club race at my local indoor track. That is sad. How does a sanctioning body put 2 very similar National Championship events in the same area. Surely if somebody actually put some thought into this, they would realize that most people, non professionals, will not participate in both the electric and nitro national championships. That’s a lot of money and a lot of missed work days. Enough venting, it’s just very disappointing and sad to see. My seeding runs didn’t go too great today. I seeded 4th in buggy and 3rd in truggy. I made some setup changes, back to my more normal setups, and in the final open practice, I felt much better. I need to get my mojo back from 2010 and 2011. I need to not change my setups and just drive the cars. I have great base setups, I need to just tune with tires, and stop testing different things to try. Our cars are the same, and I don’t need to search for some setup miracles. I did all my testing in the first two years with KYOSHO. I got my cars comfortable for me, I need to STOP testing now. That works for some, but not me. I work off confidence and knowing what my car is going to feel like. I like to be fast right away and build off confidence. Some like to start slow and build momentum, that doesn’t work for me. I need to focus on that and just realize it. I put some setups on both my cars from 2011 and I feel better now. I know what tires I’m gonna run, and I’m excited for tomorrow. We have two qualifiers tomorrow, 10 minute buggy qualifiers and 8 minute truggy. The races are long, and many things can happen. I need to focus on consistency and just running clean qualifiers. I enjoy when you comment on the mental aspect of competing.